Cuttlefish have large, W-shaped pupils, eight arms, and two tentacles furnished with denticulated suckers, with which they secure their prey. They generally range in size from 15 to 25 cm (6 to 10 in), with the largest species, Sepia apama, reaching 50 cm (20 in) in mantle length and over 10.5 kg (23 lb) in mass. Cuttlefish eat small molluscs, crabs, shrimp, fish, octopus, worms, and other cuttlefish. Their predators include dolphins, sharks, fish, seals, seabirds, and other cuttlefish. The average life expectancy of a cuttlefish is about one to two years. Recent studies indicate cuttlefish are among the most intelligent invertebrates. Cuttlefish also have one of the largest brain-to-body size ratios of all invertebrates. The 'cuttle' in 'cuttlefish' comes from the Old English name for the species, cudele, which may be cognate with the Old Norse koddi ('cushion') and the Middle Low German Kudel ('rag'). 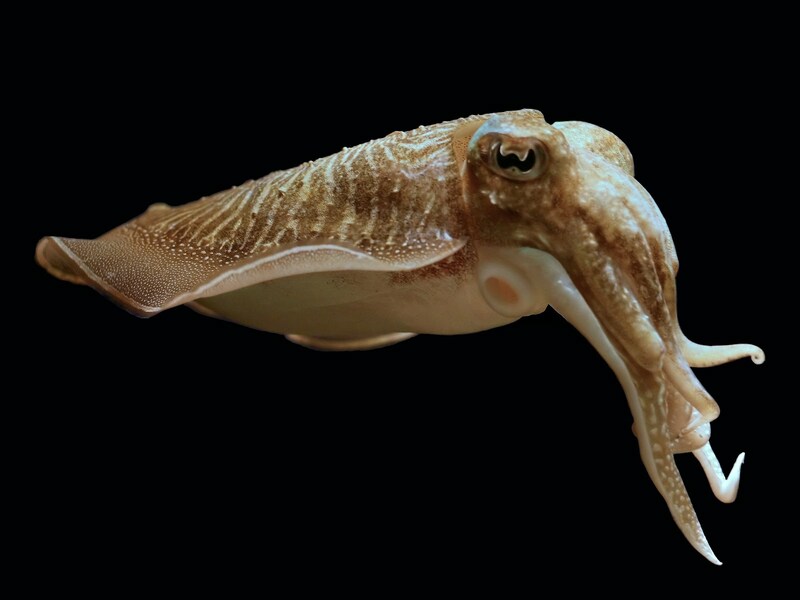 The Greco-Roman world valued the cuttlefish as a source of the unique brown pigment the creature releases from its siphon when it is alarmed. The word for it in both Greek and Latin, sepia, now refers to a brown pigment in English. The family Sepiidae, which contains all cuttlefish, inhabit tropical/temperate ocean waters. They are mostly shallow-water animals, although they are known to go to depths of about 600 m (2,000 ft). They have an unusual biogeographic pattern: they are present along the coasts of East and South Asia, Western Europe, and the Mediterranean, as well as all coasts of Africa and Australia but are totally absent from the Americas. By the time the family evolved, ostensibly in the Old World, the North Atlantic possibly had become too cold and deep for these warm-water species to cross. The common cuttlefish (Sepia officinalis), is found in the Mediterranean, and North and Baltic Seas, although it has been suggested populations occur as far south as South Africa. They are found in sublittoral depths, between the low tide line and the edge of the continental shelf, to about 180 m (100 fathoms). "The cuttlefish is listed under the Red List category of "Least Concern" by the IUCN Red List of Threatened Species. This means that while there has been some over-exploitation of the marine animal in some regions due to large-scale commercial fishing, their wide geographic range prevents them from being too threatened. Ocean acidification, however, caused largely by higher levels of carbon dioxide emitted into the atmosphere, is cited as a potential threat. Male cuttlefish challenge one another for dominance and the best den during mating season. During this challenge, no direct contact is usually made. The animals will threaten each other until one of them backs down and swims away. Eventually, the larger male cuttlefish mate with the females by grabbing them with their tentacles, turning the female so that the two animals are face-to-face, then using a specialized tentacle to insert sperm sacs into an opening near the female's mouth. The male then guards the female until she lays the eggs a few hours later. Cuttlefish are indeterminate growers, so smaller cuttlefish always have a chance at finding a mate the next year when they are bigger. Additionally, cuttlefish unable to win in a direct confrontation with a guard male have been observed employing several other tactics to acquire a mate. The most successful of these methods is camouflage; smaller cuttlefish will use their camouflage abilities to disguise themselves as a female cuttlefish. Changing their body color, concealing their extra arms (males have four pairs, females only have three), and even pretending to be holding an egg sack, disguised males are able to swim past the larger guard male and mate with the female.